I know it's an old trend, but I hadn't tried it yet, so I thought I would. 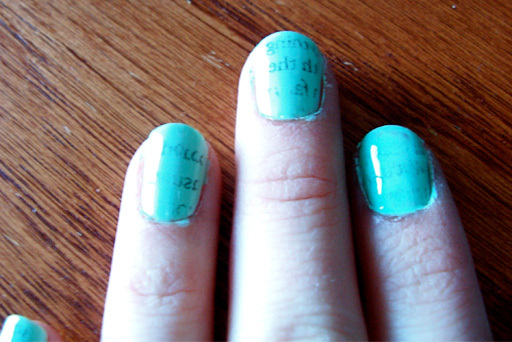 Newsprint nails, that is. I think they look really cute, and loving typography the way I do, why not put it on my nails? 1. Using a light nail polish, paint your nails as usual. Most people use a white, off-white or light grey type color, but I like to be different so I went with a light green. Sally Hansen's Mint Sorbet to be exact. You will want to make sure your base coat has dried completely before you do the news print part. And if you need to do more than one coat of base coat, make sure each coat is completely dry before applying the next. Otherwise you will smudge the polish when you apply the newsprint. A great way to test if your polish is totally dry is to tap them together. If there is a slight pull when you do this, they have not dried all the way. 2. Cut out small squares of newspaper. Use areas they have a lot of text and try to avoid any breaks in the paragraphs. One at a time, dip your nails in rubbing alcohol. Then place the newspaper on top. Dip a cotton ball in the rubbing alcohol and press on top of the newspaper and hold for roughly 20-25 seconds. This process reminded me of applying a temporary tattoo, and is definitely similar in the fact that you do not want to remove the newspaper too soon. After about 20 seconds simply peel back the newspaper. 3. Apply a clear topcoat. And that's it! Mine didn't turn out as good as I would have liked, but I think I was getting impatient and not holding the newspaper on long enough. 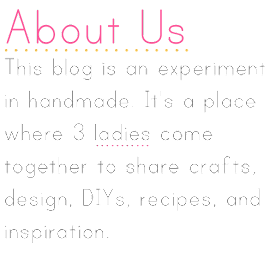 But overall cute, and more interesting than just a plan color.